Edit - The Haven Collective is now Vintanthromodern! This week I have a very fun series of posts for you! 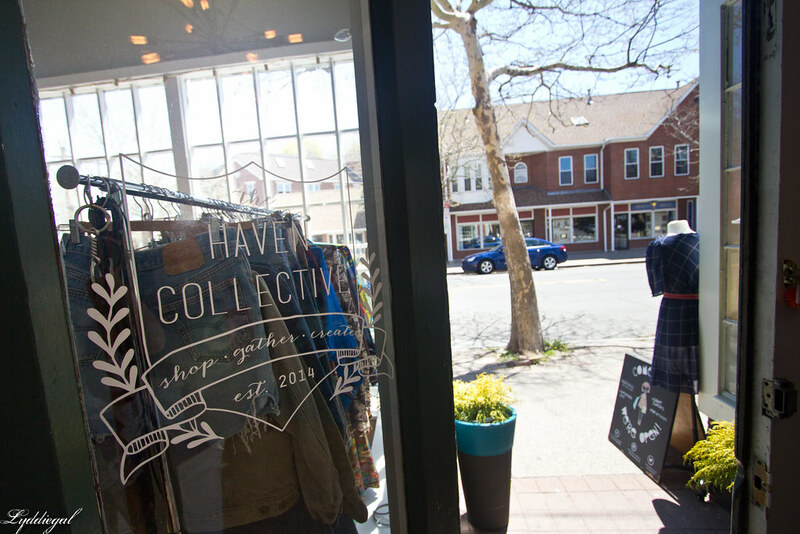 I am collaborating with The Haven Collective, a local shop in New Haven, CT. 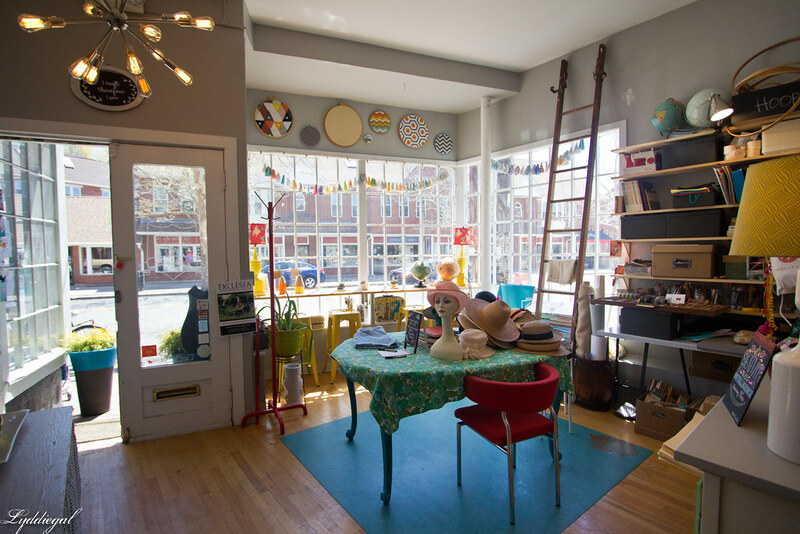 Specializing in vintage fashion, The Haven Collective is also home to a pop up shop space for local artists, and offers crafting classes on Sundays. Throughout the week I will be sharing some of my favorite pieces from the store, in some of my favorite places in New Haven. 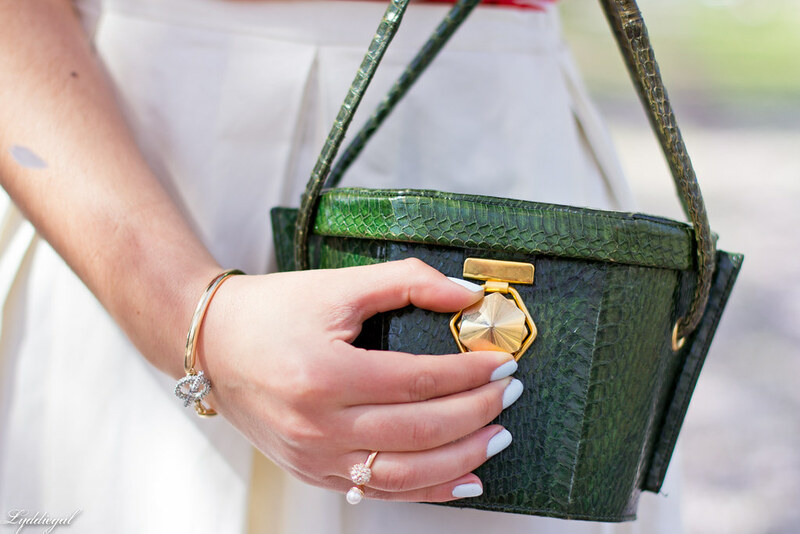 Today I'm wearing a vintage white pleated skirt and carrying the most amazing snakeskin bag, borrowed from The Haven Collective. While I love the skirt for how easily it could pass for a contemporary piece, I'm obsessed with how unique the bag is. The hexagonal shape, the huge gold clasp, the fact that is is real snakeskin; all elements which make this not only a standout piece, but you would be hard-pressed to find it's equal in a store today. 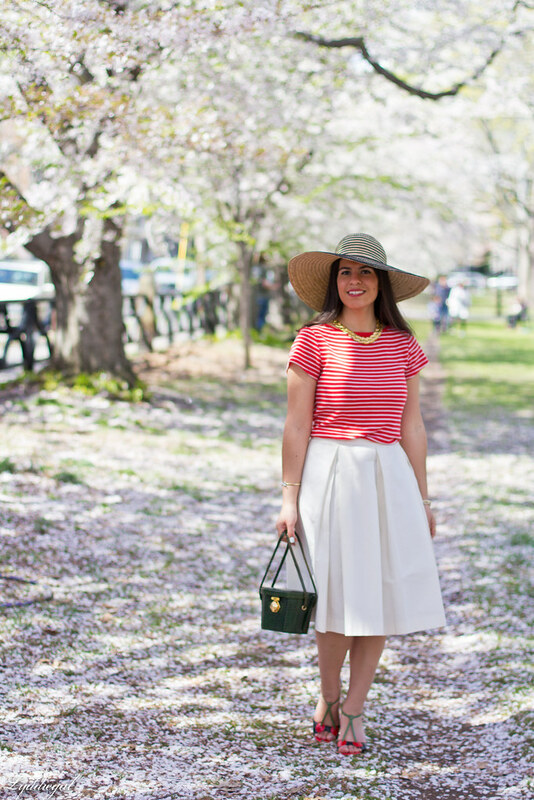 I mentioned last week that I wanted a bit more whimsy in my outfits, so I paired the skirt and bag with stripes, my cherry pumps, an oversized hat, and headed back to Wooster Square, where the cherry blossoms had just passed their peak and the gentlest of breezes would cause the petals to flutter to the ground like a snow flurry. Loooove that bag! I remember when we saw it in the store, so fun! Can't wait to see the rest of your looks! You look absolutely gorgeous!! Love the vintage bag and that skirt is stunning! Some of our local bloggers have been doing this with local boutiques and I think it is AWESOME to give them exposure! Meanwhile this is probably one of my favorite looks you've ever had! Those cherry pumps, as I have mentioned many times, are my absolute favorite. That bag is an absolute dream! I can only imagine the stories it would have to tell if it could talk - I can just imagine it attending all kinds of fabulous Gatsby-esque parties in its heyday. But it's equally lovely on you in this pretty spring look. The cut of that skirt is absolutely perfect; it's so versatile, I can absolutely see it in a modern outfit with a crop top and architectural sandals, but it's equally at home in this vintage-inspired look and just beautiful with your red top. 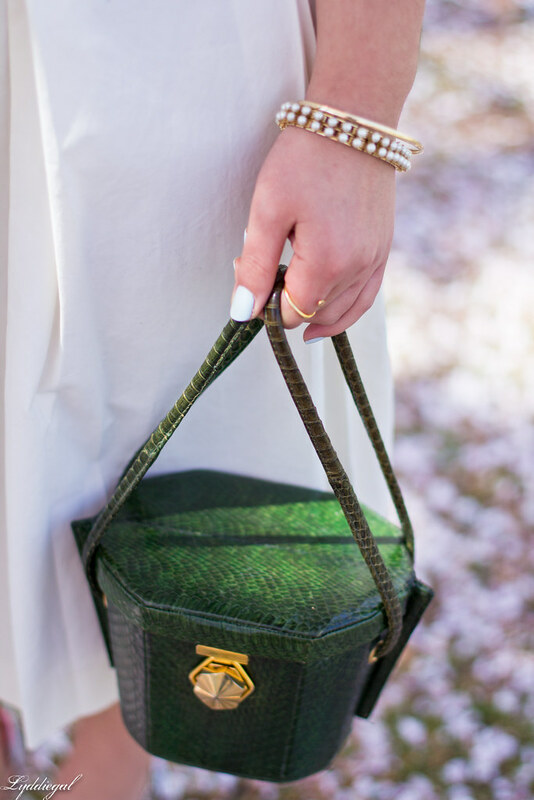 The bag is lovely and your look is feminine and sophisticated, love it! Love everything about this look! The green mixed in with your bag and shoes is fabulous. First of all.. you look lovely - and I'd love to visit the shop whenever it is I travel to your area. Ooh that sounds like a fun store! This is the perfect balance of classic and whimsy--I love how all the elements came together here! And as always, these photos are gorgeous. I'm loving your white pleated skirt! 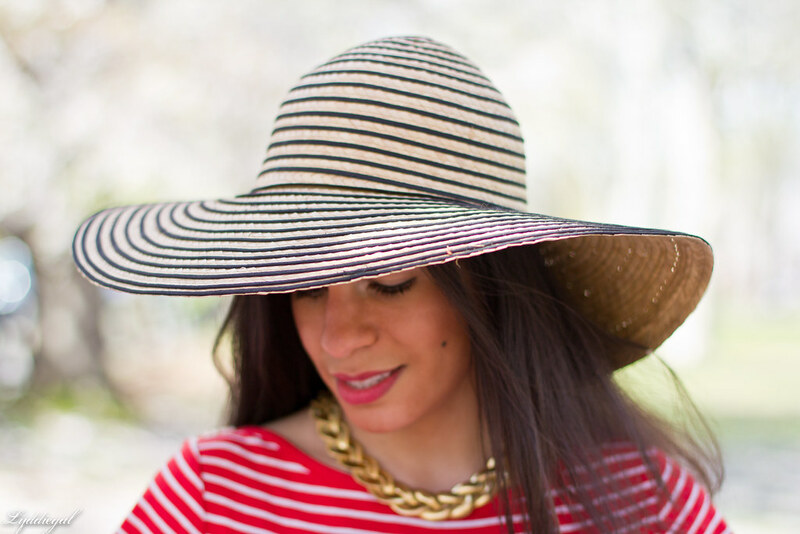 It's amazing with your floppy hat! You look amazing! Perfect lady outfit. What a fun collaboration! I love the overall feel of this look. That skirt is perfect on you. Really I am dying over the bag though. Too cool! 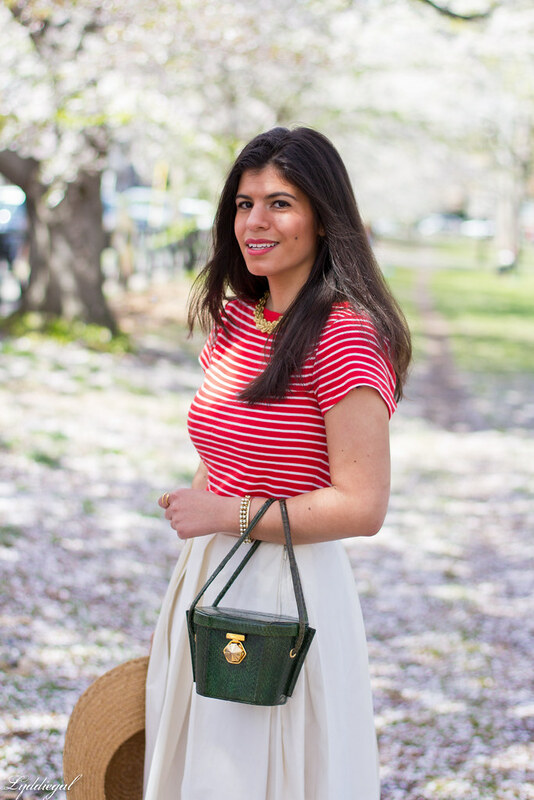 That skirt looks so pretty on you...and I love that your striped top is red, love the different color! 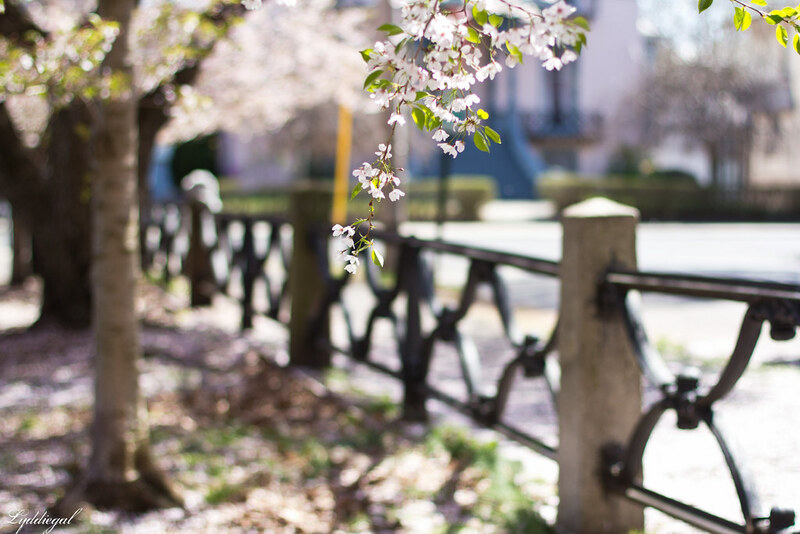 spring perfection, you look so pretty. What a great vintage inspired skirt! 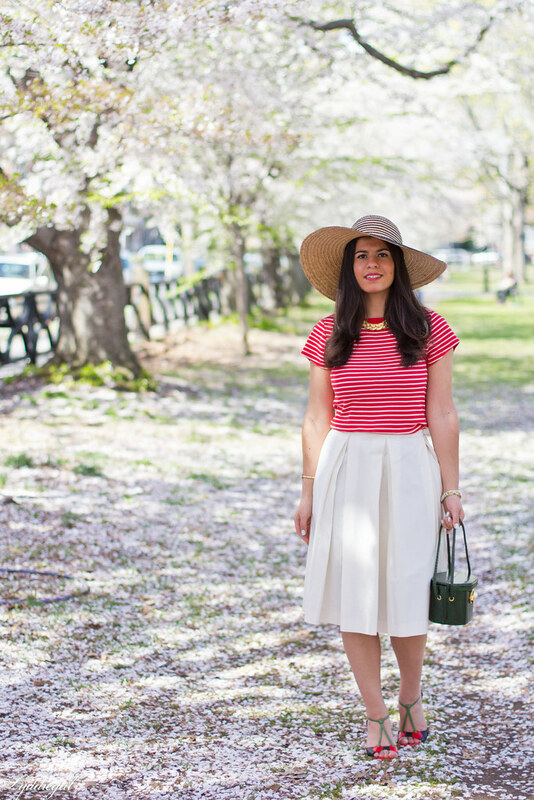 Though the silhouette is vintage, midi length skirts feel so current right now. What a fun store! That skirt is definitely timeless. I can see why you are so enamored with that bag. It's so unique! I love the shape of that bag, and the hat is so summer! This is just the cutest outfit! I love to see those heels and the bag matches perfectly with the outfit! It's such a cool design! My kind of look! Gorgeously beautiful with a hint of vintage. Those sandals are adorable. Oh la la, French riviera is waiting for you Lydie. So cute and lady-like. The bag and shoes are so fun and unique! You look gorgeous! That skirt it looks amazing on you and I love it with the stripes! This would be perfect for memorial day too! I love this sort of 50's inspired skirt. I like the white tone and the way you've matched with those red & white stripes. Whimsy & pretty - you are channeling your inner duchess here!!! Such a pretty outfit. That skirt and purse are darling! I love the way you combined the vintage items with the modern items, it always leads towards a great look. You are so adorable! I love how clean the pleats on your skirt are. Really great vintage look! This outfit is killer!! I cannot get over how stunning these photos are and the background!